Amazon pretty much invented the smart speaker market in 2014 with the introduction of the first Echo, but now it's a fiercely competitive field. We just saw a major refresh of the Amazon Echo line-up – so are these Alexa-powered devices still the best smart speakers? Specifically, are they a better option than the Google Home speakers, which were introduced by Google back in 2016 (and are actually due a refresh themselves). 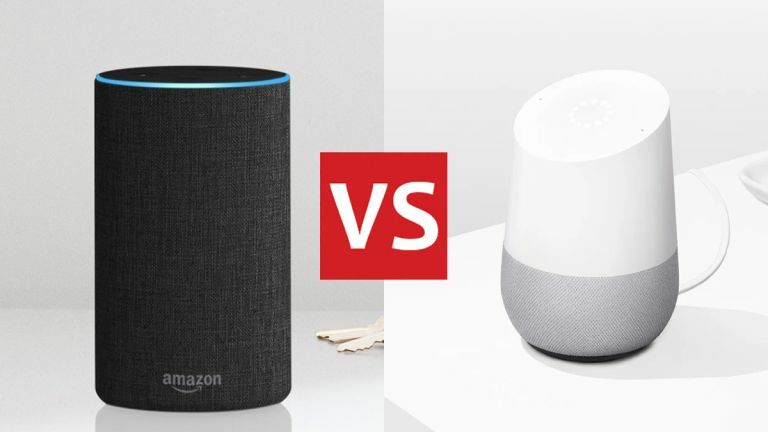 Here we'll compare the two smart speakers against each other in all the categories that matter. With each passing update, the Amazon Echo line gets more appealing from an aesthetic standpoint, and the 2nd-gen Echo and the brand new Echo Plus make superb use of fabrics and curves to be two of the best-looking smart speakers on the market at the moment. For the standard Echo, you've got three fabrics and a walnut finish to pick from. As for the Google Home, is it us, or does it look a bit dated now? Back in 2016 the design of the Google Home seemed funky and modern, but two years down the line it's starting to show its age, and looks a little clunky when put next to the newest Echo speakers. You can get six different colours for the base, but they cost extra. This round has to go to the Echo then – sorry Google. We do know there's a hardware event coming up for Google in the next couple of weeks, so the original Google Home may be in line for a much-needed update. It's not that it's an ugly-looking device, it's just that the compact Echos have overtaken it. There aren't too many specs and features to talk about in terms of smart speakers. The 2nd-gen Amazon Echo packs in a 2.5-inch downward-firing woofer and a 0.6-inch tweeter, developed in partnership with Dolby – it sounds better than the original Echo for sure, but it's not going to replace your hi-fi music system anytime soon. Likewise the Google Home, with its "high-excursion" internal speaker – meaning a speaker that can move more air than normal. Overall we'd say the Echo just edges it here, but it's close: you'll get decent music playback from the Google Home, though we still reckon you'll mostly use it for podcasts and radio rather than your Spotify collection. Both speakers come with competent companion apps for iOS and Android, both have intelligent digital assistants on board (of which more in a moment), and both can tie into larger ecosystems (working with Chromecasts and Amazon Fire TVs, respectively). Here we'd say it's about honours even – a lot of the features are the same across the board. Amazon Alexa has tens of thousands of digital skills at its disposal, making it the most comprehensive smart speaker platform out there – if you need something doing, chances are Alexa will be able to do it. It's also appearing in more and more devices, not necessarily all made by Amazon either. Google Assistant, on the other hand, doesn't have the same kind of breadth as Amazon Alexa, but does have the power of Google's AI research underpinning it. It's available on Android and iOS smartphones, Android TV and Chromebooks as well as the Google Home speaker, and of course ties in well with most other Google apps and services. If you're already heavily invested in the Google ecosystem, you'll probably find the Google Assistant of most use to you; but on the other hand Amazon Alexa has more tricks up its sleeve overall. In terms of what you can actually do with these digital assistants, both of them are going to prove very useful cogs in your smart home setup. Let's not forget the mini options here too – the Amazon Echo Dot and the Google Home Mini. Packing in the same AI skills, if not the same audio output quality, these dinky speakers represent excellent value for money and can be installed just about everywhere. So which is better? Again, it's a close call – the fact that you can plug an Echo Dot into another speaker via a 3.5mm audio cable might just give it the edge in terms of versatility, though Google's dinky speaker has a slightly more appealing design than its Amazon rival, even taking the 3rd-gen Echo Dot refresh into consideration. There's still the same Amazon Alexa vs Google Assistant face-off here, and again both digital assistants are very competent indeed. Both Google and Amazon have been very good at adding new features over time as well. You're not going to be disappointed with either of these smart speakers. Google might have copied Amazon's idea with the Google Home, but it's copied it well, and the underlying smart assistants continue to improve and are hard to separate. Overall we reckon the Amazon Echo just has the edge, with Alexa now so capable and so ubiquitous, and with so many skills at its disposal. You can also buy the Echo in more different form factors at the moment, though Amazon has nothing yet to compare with the huge Google Home Max. As for Google Home, it's still a fantastic buy, especially if you spend a lot of time inside Google's apps and services, and use Google Assistant on your smartphone. With future product refreshes likely to be on the way in the near future, watch this space.